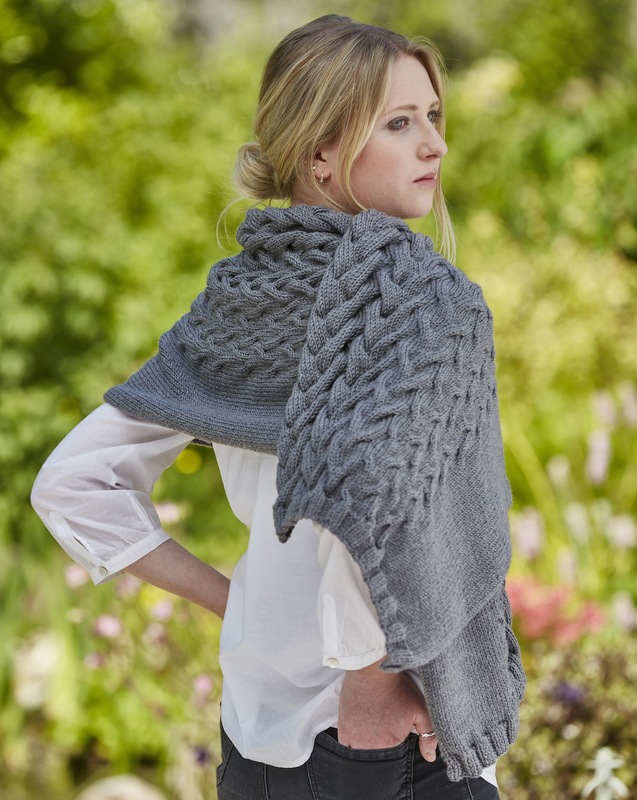 Shadowlines features deep cables, wrapping luxuriously around your neck, decreasing in depth until the shawl smoothes out around your shoulders. When I make big projects, I tend to reach for neutral colours so that I have maximum chance to wear the thing after all the effort I’ve made. Hence I chose charcoal grey Cinder in MillaMia Naturally Soft Aran. However, I think this shawl would be amazing in bright scarlet, gold, or raspberry. And stunning in rich teal, forest green or plum. Aside from playing with your colour choice, I do want to talk about the yarn weight. This is aran/heavy worsted. How about something less practical and more luxurious? Alpaca in a winter white? Not just any alpaca; bulky alpaca. A snuggly fantasy. A project out of a Narnian winter. One of the samples I can’t wait to share at Yarndale this weekend is the Eden Ccottage Yarns Whitfell Chunky version of this shawl, in Natural. We swatched this (below second from left) to show the option and we all fell in love with it. Photos will follow, I promise, and the knitting details are all in the book. 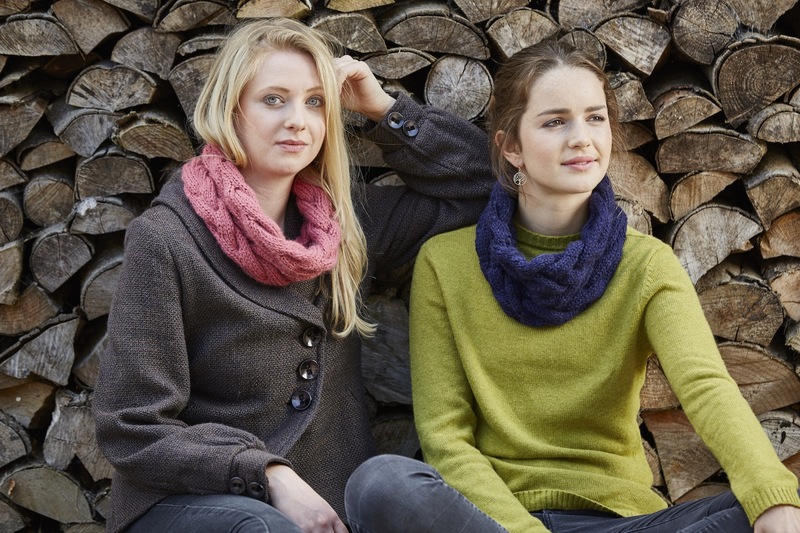 Come and see the sample yourself at Yarndale on Eden Cottage Yarns stand no.11, near the knitters’ lounge. Also shown above (second from right) is a rustic wool from Yorkshire Spinners. I imagine this as an “outdoor walk” version. It’s Yorkshire Spinners Bluefaced Leicester Aran in undyed Natural Lt Brown. The simplicity and modern take on the cables makes this a city project in an urban yarn such as Blue Sky Alpacas Suri Merino in Fog. There’s a great choice in sophisticated, muted colours in this yarn. Maybe you’re thinking of more of an every-day version for a school run, dog walk or commute. 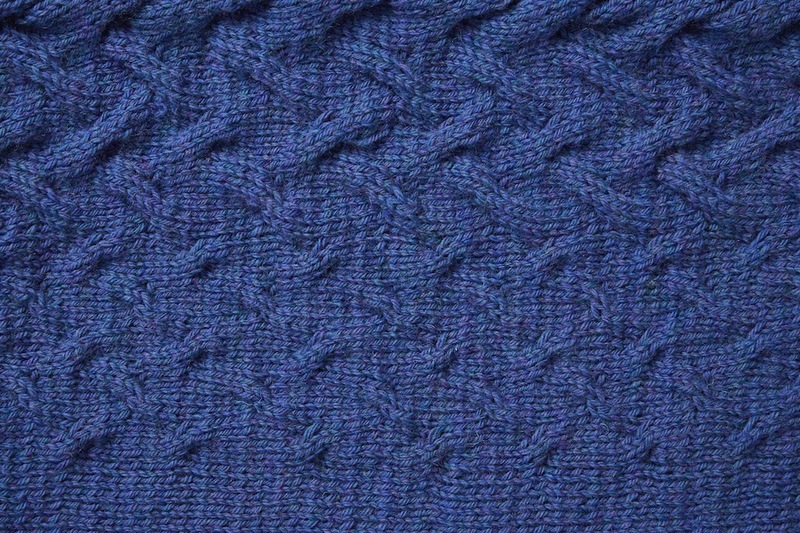 Yes, we test knit it in Cascade 220 and it looks perfect. The yarn is just heavy enough to work well, coming up slightly lighter fabric than the original though knit to the same pattern. Although it isn’t widely available in the UK, I know it’s a go-to yarn for this size of project in the US. Two of the test knitters have planned yarn for a second project, or have already started! Talking of everyday projects brings me neatly on to Umbra. 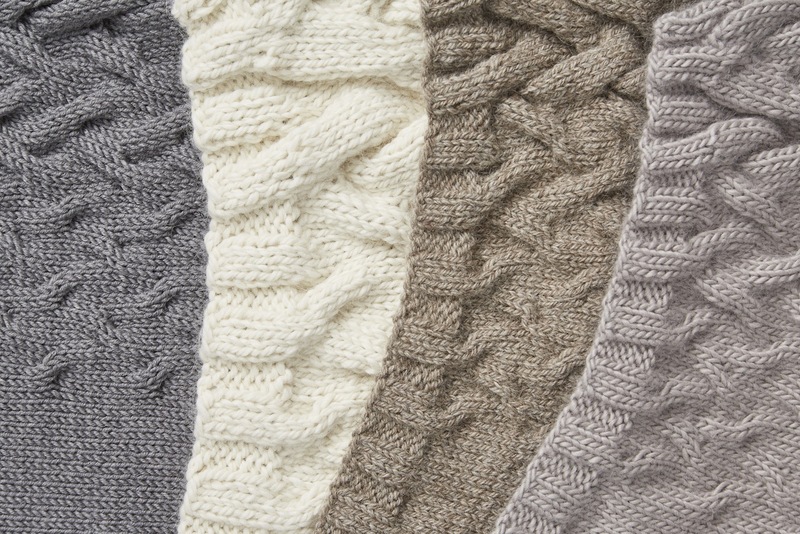 A cowl for every day. Make it in several colours. Make it as a gift. The choice of yarn influences how your project will look. I love the Eden Cottage Whitfell Chunky for this project: the cables sink into the yarn, and the sweet colour palette is lovely. This is Echinacea pink. 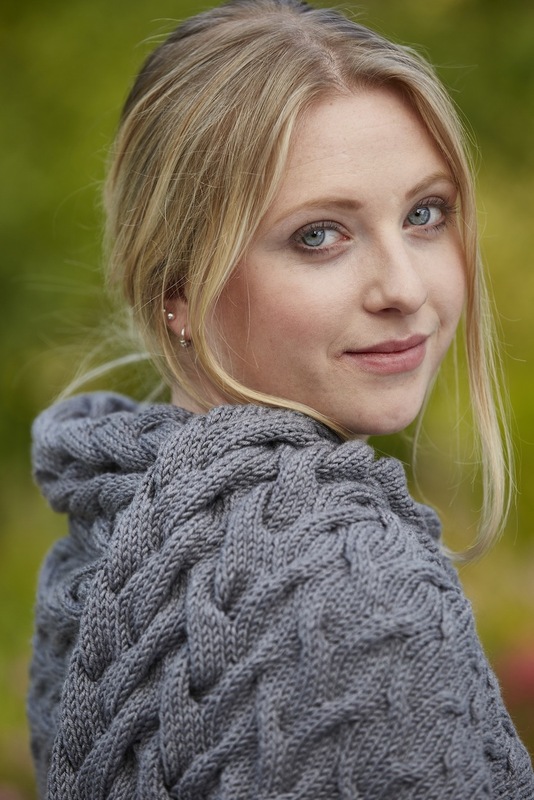 It was making this cowl that prompted me to consider the yarn for the larger wrap – the cables are just so soft. I also tried out The Fibre Co Tundra in Diablo Beach blue, one of a range of rich colours, which makes for a more sculptural effect. Between these two colour ranges it’d be hard not to find your favourites! The project fits from 2 skeins of either of these yarns, so it’s a treat but I was determined not to go over the top and into a 3rd skein for a small project. You can go all the way to super-bulky for this little project, or down to DK. It’s a great gift out of one skein of DK, and brings the cables down to unisex proportions for a “dude snood” (that expression always makes me laugh). Being a small project, it’s especially versatile. I’d keep the wrap to the range of light worsted through to bulky; it needs to be snuggly but not too heavy. I think that’s plenty of choice! What kind of Shadowlines would you like to make? Will you start with a little Umbra while you plan the perfect winter wrap? We’re voting on the first KAL from the book in my group this week. Come and help us decide on our cowl season KAL – there is a prize of a free copy of the ebook up for grabs if you join in the discussion! Knit Play Colour is available to pre-order now as an ebook on Ravelry, or as a printed book (including a download code for a free copy of the ebook). Patterns are being shared during September, with the book released on the 29th. There is just one last pattern to share on the 29th. I can’t wait! Images © Jesse Wild 2015.